Learn where you and your squad should be dropping with our guide to the best loot spots in Apex Legends. Apex Legends remixes the battle royale formula is a lot of ways, but the opening stages of the game will still see you scouring the map for loot to see you through your early fights. Much like other BR games there are places with good and bad loot spawns, so it’s worth learning the best places to gear up before you drop. 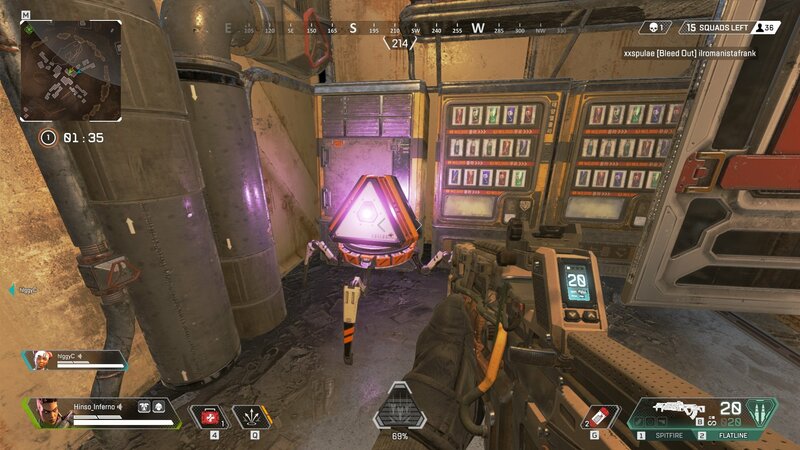 In this guide we’ll cover where to drop and find the best loot in Apex Legends. Apex Legends splits its loot regions into tiers, and when you drop into an area the game will helpfully inform you at the top of your screen whether you’re in a low, medium or high tier loot spot. It’s worth trying to remember the best regions when you explore the map, but we’ll also take you through some of the best places to give you a headstart. 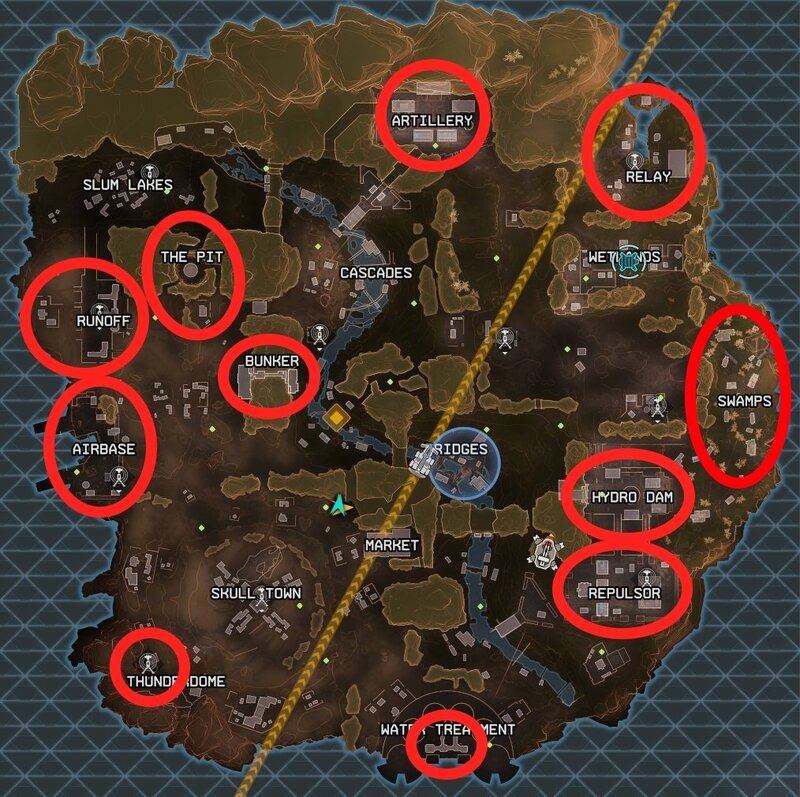 Check the map and the list underneath for high tier loot spots that you should consider dropping to at the start of each game. Pretty much all the named compounds on the map will give you good loot, but a few are safer than others. Because these are all High Tier loot spots, you can expect players to drop to them fairly regularly. That said, most players prefer to drop early, so if any of these areas are at the end of the dropship path then you’ll likely be able to loot them without much competition. We’ve also had a lot of success visiting the location marked above, to the east of Cascades and south of Artillery. Despite not having a name, the cliffside and valley here are littered with crates to open, offering up more than enough gear for three players. Most player aren’t aware of this spot, but be careful if you do come here as the land is very open so any nearby players will spot and fire on you quickly. As ever, Apex Legends does things a little differently too, and includes a couple of varying features when it comes to finding the best weapons, armor and equipment. 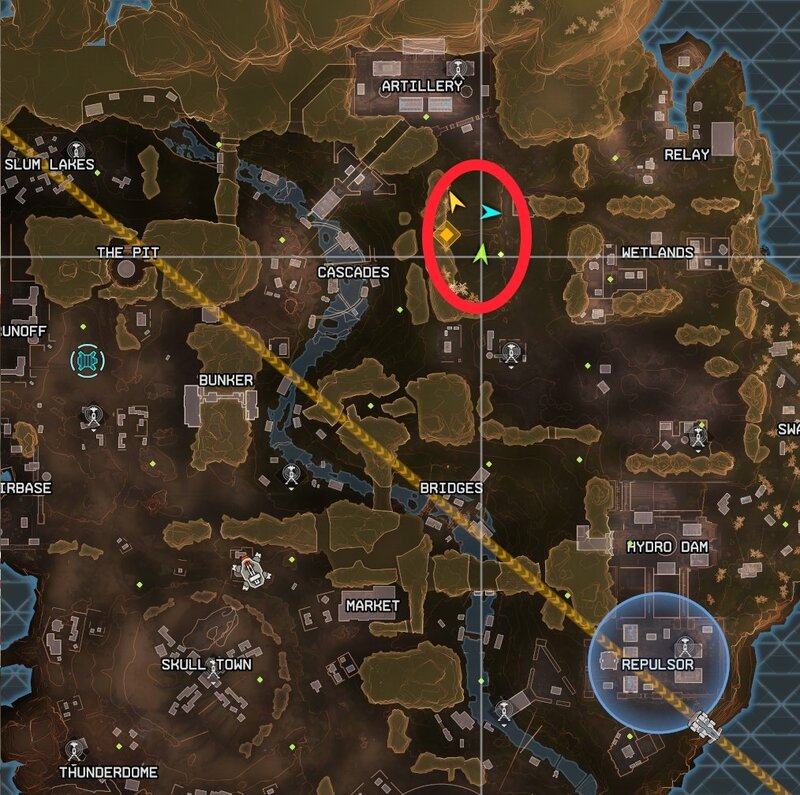 At the start of each game, a Hot Zone will be marked on the map by a blue circle. This means that for this game, that area will have a greatly increased chance of high tier loot appearing, as well as the possibility of grabbing a weapon with all attachments filled out. 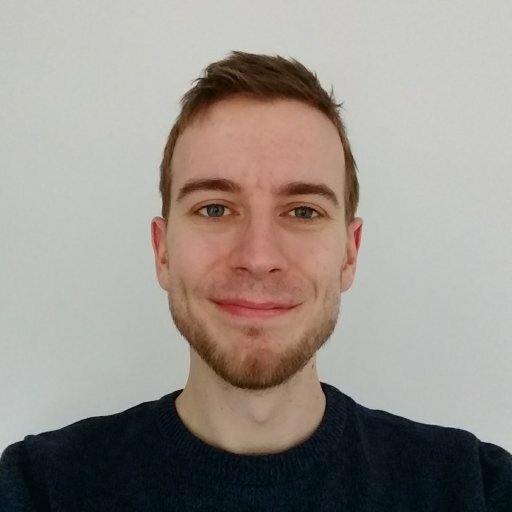 The Hot Zone will be marked on all players maps, so if it’s close to the first half of the flight path then you can expect a lot of players to drop there. If you win the fight, brilliant, but it’s a big risk. We’ve generally found that if the hot zone is at the back end of the flight path, most players won’t bother sitting around in the dropship for a long time, so you can safely hit the Hot Zone for some extra loot. Another new idea Apex Legends introduces is the Supply Ship. Much like the Hot Zone, this will appear in a new location at the start of every match, so check your map edges for it each time. The Supply Ship offers the best initial loot of anywhere on the map, usually beating the Hot Zone for quality weapons and armor. It’ll fly across the map before hovering over a marked location and laying down zip lines that players can ride up to it. If the Supply Ship travels anywhere near to the dropship path, it’s possible to fall down onto it as it moves during the start of the game. This is the fastest way to deck your team out in the best equipment around, but be prepared for a fight. The Supply Ship isn’t big, and can regularly see two or three squads land on it. You’ll need to be fast and efficient in your looting and shooting. Over the course of a game, supply drops will be announced and fired into the arena. The characters in your squad will speak out if this happens close to you, so open up your map and look for a blue ping marker (waves of circles on a small spot). This is where the supply drop will be landing, so set up in a defensive position nearby and watch for enemies while you wait for it to come down. Each supply drop contains three pieces of gear, which can include weapons, armor, attachments and consumables, but all of it should be at least Tier 2. You may also run into supply drops that have already landed. Check to see if they’ve been opened from a distance (the white walls will still be down) before you risk approaching them. You’ll also want to keep an eye out for loot drones. These are small, fidgety spider-like robots that appear identical to Apex Legend’s loot crates. They can crop up all over the map, but if you see one then all you need to do is shoot or melee it and it’ll explode, throwing out some valuable gear. Finally, Lifeline’s Ultimate is one of the most useful in the game, calling down a Care Package for your squad. This is one of the best ways to deck out your team in between fights, so we recommend giving any Ultimate Accelerants you find to the Lifeline on your side to use this ability as often as possible in the early stages of the game. That’s all there is to know on where to drop and loot in Apex Legends, but we have many more guides to give you the leg up in the arena. For starters, here’s our guide on the best weapons in Apex Legends.